This is a focused issue dedicated to the memory of the late Professor Ben-yu Guo (1942–2016), a prominent numerical analyst at Shanghai University and Shanghai Normal University, and a prolific researcher with more than 300 peer-reviewed publications, many of which are in prestigious journals. His work has been well recognized in the world and extensively cited. He received numerous prestigious awards, including a degree of Doctor of Science honoris causa from Sanford University in England. Professor Ben-yu Guo made outstanding contributions in many areas of computational and applied mathematics. He introduced the concept of generalized stability of approximations to nonlinear problems, which generalized the corresponding results for linear problems. This pioneer work provided a powerful framework and a series of effective tools for analyzing the stability and convergence of numerical methods for nonlinear problems. He developed the first vorticity-preserving finite difference scheme for numerical weather prediction. Moreover, he designed a systematic approach to construct finite difference schemes which conserve important physical quantities, and successfully applied them to numerical simulations of various problems arising in fluid dynamics, quantum mechanics, and other fields. Starting from late 1970s, Professor Guo turned his attention to spectral methods. He developed pseudospectral methods for nonlinear problems with good stabilities while keeping spectral accuracy. Since late 1990s he introduced a series of weighted Sobolev spaces of the Jacobi-type, Hermite-type, and Laguerre-type, and established the approximation theory in the framework of these weighted spaces. Under the guidance of this new approximation theory he systematically developed the spectral and spectral element methods. He designed various spectral methods on triangles, spheres, and unbounded domains, as well as spectral element methods on polygons, and spectral collocation methods for nonlinear ordinary differential equations. These results formed solid mathematical foundations for the corresponding spectral and spectral element methods. In addition to the aforementioned work, Professor Guo carried out research in many other fields. He generalized the Painlevé analysis to various non-integrable systems, obtained important results in mathematical biology, and on partial differential equations arising in fluid dynamics and mathematical physics. Professor Guo was also a dedicated teacher with over 30 Ph.D. students, among whom many are active researchers in various academic institutions around the world. He had a tremendous influence on all of his students and many other young people and helped them wholeheartedly in their career. As we approach the third anniversary of his passing, we present this focused issue to commemorate the late Professor Ben-yu Guo’s life and scientific legacy. 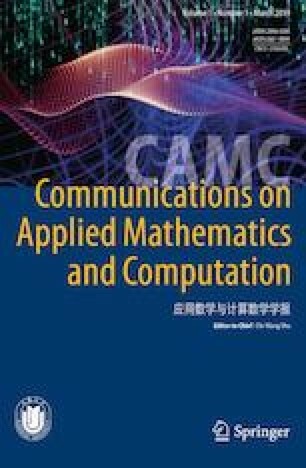 This is especially meaningful as the first issue of the revived, English only version of Communications on Applied Mathematics and Computation (CAMC), a journal founded by Professor Guo many years ago. This focused issue contains three parts contributed by authors from many countries, among whom are his friends, colleagues, and former students. The papers in this focused issue cover a wide spectrum of applied and computational mathematics, and hopefully they will set the tone to the high quality of papers for the revised English only version of CAMC.